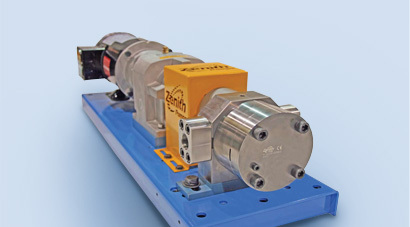 Circor metering gear pumps from Zenith serve a variety of industrial markets, as well as the oil & gas and power generation industries, supporting process applications with precise, pulse free and reliable fluid handling systems. Since 1920, Zenith has offered engineers pulse free precise flow with low NPSH (net positive suction head) requirements. These positive displacement pumps utilize an intermeshing gear system that rotates within a housing. As the gears rotate, a void is created drawing the material into the pump. The tight operating tolerances of the gears and available material options for the housing provide significant advantages in fiber, polymer processing, adhesives, paints, food and other markets. Located in Monroe, NC, the Zenith manufacturing facility is ISO 9001:2000 Quality Management Certified. CIRCOR Pumping Technologies, a CIRCOR International (NYSE: CIR) business, is a global leader in delivering fluid-handling solutions for critical applications in the commercial marine, defense, industrial, lubrication, oil & gas and power generation markets.